When lifting a structure from an installation vessel, there are several challenges to overcome, and one of them is to predict and control the forces in the crane and in the structure that is being deployed through the splash zone. This is done by limiting the maximum sea state (wave height) for the operation . This limitation can become very restrictive for structures generating large hydrodynamic forces, like suction anchors. The aim is to utilize the installation vessels to their maximum, waiting for weather should be kept to the very minimum. 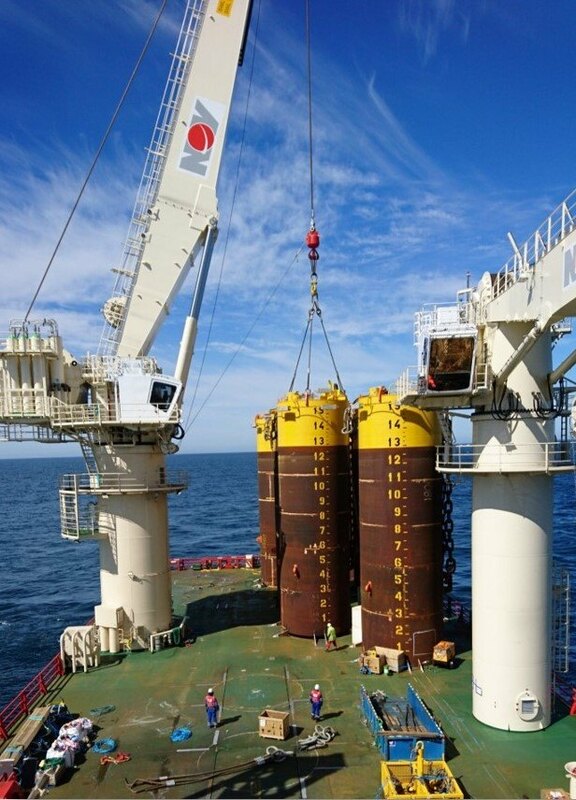 In 2017, TechnipFMC installed fifteen suction anchors for the Statoil Hywind Scotland project (five wind turbines in the UK sector). The anchors, each weighing 100t and being 16m tall, needed to be installed from the vessel Deep Explorer in April, a time of year with rather rough waves in the North Sea. Preliminary installation analysis showed very low sea states were required for deployment, surely leading to a very long wait for weather (/a narrow weather window). This scenario, based on many repeated similar operations, was perfect to test and validate a new system for reducing the weather limitation. The NOV Splash Zone Mode was developed to solve the exact challenges that TechnipFMC were facing. The Splash Zone Mode is a combination of active constant tension and active heave compensation, enabling the crane to lower the load through the splash zone while trying to minimize the effects of vessel motion and wave forces on the load. But there was one concern: How well does it work? Or rather, when planning the intended offshore lifts, how do you set the weather criteria based on the Splash Zone Mode’s performance? Methods and tools to analyse offshore operations involving splash zone crossings do exist, but none of these account for new technological developments such as the Splash Zone Mode. It was clear that current analysis tools and methods required to fully plan and document the performance to the necessary standard simply were not sufficient. Working together, NOV and TechnipFMC saw the value of keeping the overall engineering processes unchanged. This meant that the new methodology and tools needed to be seamlessly integrated into existing workflows. Both parties also needed to keep their intellectual property internal, but at the same time utilizing it to achieve the objectives of this operation. Through extensive cooperation and mutual development, the Crane Simulation Module (CSM) proved to fulfil these needs. 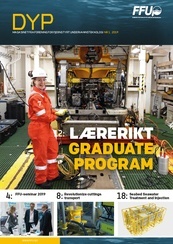 The CSM contains detailed numerical models of the NOV Crane Control System and winch behaviour, allowing TechnipFMC to fully analyse the effects of the Splash Zone Mode and other heave compensation modes implemented on the vessel Deep Explorer in their offshore lift analysis software (Orcina OrcaFlex). The CSM has the same constraints as the real crane, integrated directly into the lift analysis, enabling Technip to reach a new level of understanding during the planning phase. 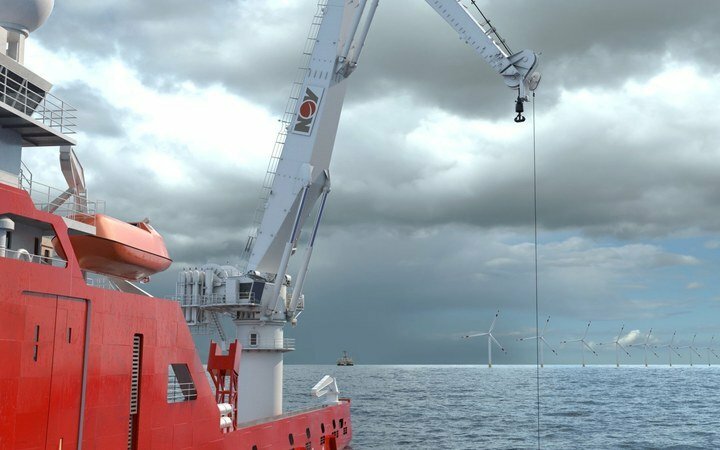 TechnipFMC decided to retrofit the Deep Explorer crane with the Splash Zone Mode for the installation of the fifteen Hywind anchors last April. The upgrade was mainly in the crane control system, but it also involved some offshore testing and fine tuning on board. The offshore installation of the anchors was very successful, and the ability to use the Splash Zone Mode has saved in total around eleven days of waiting for weather. The new mode was well received by the crane operators and the offshore crew in general. The Crane Simulation Module proved to be a new and useful platform for exchanging knowledge, experiences and ideas between the engineering departments, establishing a community of practice across companies. The combined effort of TechnipFMC and NOV to develop and implement cutting edge technology resulted in a significant expansion of the lifting operation weather window. Through testing in real situations, we could prove its validity and verify its limits.